Every parent on earth knows that air travel with kids can be a real slog. Getting through the airport and onto a plane with toddlers in tow can often feel a bit like shepherding a herd of wild animals. What’s more, extended stays in airports, especially when the flight is delayed, further compounds problems of boredom and restlessness in young minds. The experience is always worth it when you reach your destination, but there might be a moment at the airport when the kids are screaming inconsolably, you’ve lost the boarding passes and other passengers are pausing to side-eye your parenting. That said, getting on a flight with kids is something parents just can’t avoid, like changing diapers or Justin Bieber. So what are the best ways to avoid disaster on airplane journeys with children? Calming kids down can be a science, and it takes a real Einstein to keep everyone relaxed. We’ve compiled a definitive list of tried-and-tested tips from our travel expert friends and parents across the globe to help you to get the best out of the flight experience with kids. Hell, if all goes to plan you might even enjoy it. If you’re planning a trip with your kids this summer, a bit of advanced thought will save you a world of stress. Obviously hotels and transport are the first things to organize, but how about planning your route through the airport itself? Toddlers can shift moods in a second, so the greatest thing you can do — whether it’s in the check-in queue or embarking the plane — is be ready. Knowing ahead of time what to expect at airports, and what amenities, if any, airlines offer is always a good idea. For starters, head over to our AirHelp Score for Airports to see how your departure airport ranks globally. Here you’ll find a score for how the airport performs on quality of service, on-time performance and passenger experience. Travel enough with your family, and chances are you’ll encounter a flight disruption at some point. Delays, cancellations, overbookings — they’re all part of the air travel experience and can put a downer on any family holiday. Stuck at the airport for too many hours with young kids can get nasty. But did you know that you could be owed up to $680 in flight delay compensation under EU passenger rights regulation EC261? At AirHelp our mission is to get that money back for you and get your holiday back on track. If you are eligible for flight compensation for a family trip, chances are you can get cash for your kid’s tickets too. Regarding compensation and reimbursement or rerouting for denied boarding, delayed or canceled flights, the EC261 passenger rights regulation makes no distinction for passengers based on age. The EC261 regulation covers passengers of any age unless they were traveling free of charge or at a fare not available to the general public directly or indirectly. Since the broad term ‘general public’ is not defined by a general criteria, such as children under a certain age, it is not relevant whether a minor’s ticket was bought at a lower price than an adults. Both categories of passengers are equally inconvenienced and therefore have the same rights under the EC261 regulation. When it comes to travel troubles, the best advice we can give is that you know your air passenger rights. Here’s Scott, to run you through the basics of flight delay compensation. For family travel, never underestimate the benefits of a suitcase expertly packed to perfection. Getting the contents of your children’s suitcase right is just as important as yours, so put aside some time for getting the right balance of clothes, shoes and toys. When it comes to packing for holidays with kids, our friends over at Mumsnet are experts. They’ve compiled a few fantastic checklists of ‘Do’s and Dont’s’ for how to fill your suitcase for a family trip. Another handy tip to save yourself some stress at the airport is to steer clear of large stowaway luggage. Fit your family’s gear into smaller carry-on bags to take on the plane. Giving kids responsibility for their own suitcase at the airport is often a cunning anti-tantrum distraction. For tips on which carry-on bag to go for, check out our guide to the best carry-on luggage for expert travelers. One thing all parents can agree on is that a tired child is an unhappy one, especially when air travel has disrupted the routine. Justin Soffer, Vice President of Marketing at Travelzoo. Before you book, have a look at our AirHelp Score for Airlines to help you choose an airline with good on-time arrivals. Here you can also find how airlines rank for quality of amenities and also how well they resolve flight delay compensation claims. 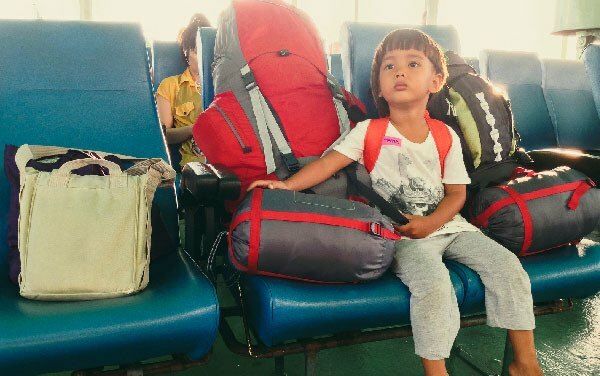 Traveling can be really exciting for kids, and it’s your job to make it so. Point out fun things on the runway or examine ALL pictures in the inflight magazine. Make the mundane exciting, it’s a real skill. Get the best out of the initial travel excitement for kids. This way, you can keep them excited and entertained for the first few hours before pulling out the games or electronic devices. Give kids a task that involves making a list: Have them look for one object that begins with each letter of the alphabet before and during the flight. Or have them make a list of objects of a certain shape or color that they can spot before or during a flight. Tangela Walker-Craft, family blogger at simplynecessaryinc. There’s no better way to curb a tantrum than distraction. That’s why an extra bag of toys is worth its weight in gold. Always have a new treat or teddy to reveal when the going gets tough. It might just make the difference. While electronic devices like tablets and phones are obvious tools for soothing frantic kids, you might want to consider a bit of old fashioned fun. The more screen time kids have, the more cranky they’ll be when the phone or tablet is taken away at the time of disembarking. Here are five great travel board game suggestions to play at the airport or take on the plane with you for family holidays. Let’s face it, you’re probably going to need some allies on this aircraft. So when boarding be sure to strike up conversations with any other parents who are getting on your flight. You may not be lifelong friends, but at least you’ll have someone to exchange glances with when your toddler is having a screaming fit at 30,000 feet. “My secret is don’t sit next to them. It WORKS!!! Well, once they reach a certain age at least,” says Joronda Montano from Neckup Checkup. Jet lag is not your friend, and can make crankiness reach peak levels for kids. Head over to our jet lag advice post to find out the best professional and scientific ways to beat it.